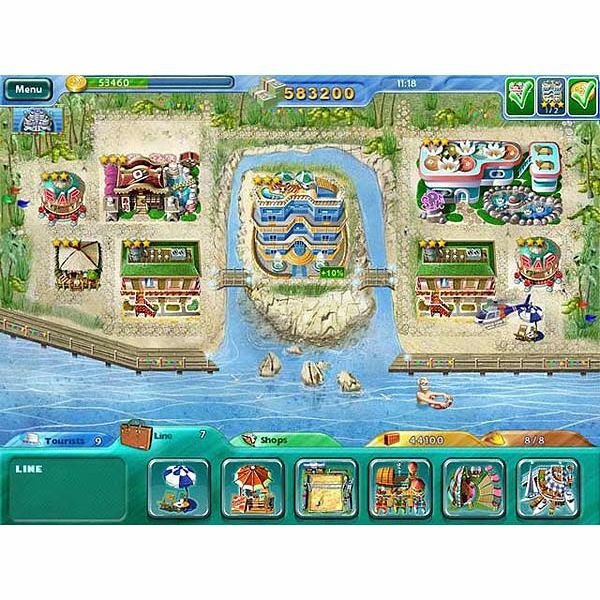 In this time management real estate simulation game, two sisters have inherited a tourism business and a large mansion. A short time later, one of the sisters mysteriously disappears and the house gets sold. What happened to the sister? The mystery must be solved and the mansion must be bought back to keep it in the family. Earn money by turning the tourism business into a profit making success by buying and selling vacation property. Vacation Mogul has five islands with multiple levels for hours of time management strategy fun. During each level of play, you will have assistant Mila Jones to help you with keeping up with your current goals. Earning money and drawing in tourists are your main goals in most levels. Buildings and other structures require resources and workers. If you need resources, click on the tab with the brick icon and select the amount needed. Construct buildings like bungalows and hotels by clicking on the “Tourist” tab. Here you will see the buildings that are available to you. Click on the appropriate building and then click on an open space of land. Workers will then immediately start building the structure. Once accommodations are built, they will begin to earn money. Upgrading buildings earns more money. However, you will still need resources to construct them. Aside from the accommodations, you will need to offer other things to draw in tourists. Things like beach chairs and shops help with this effort. These items are located under the “Line” tab. On occasion, buildings will need repair. This will require resources and workers. Click on the building to send workers to fix it. Game play continues on a level until goals are met. A summary screen will display showing the amount earned, any time bonuses and experience points. In between levels blueprints can be purchased for new types of buildings. Once you buy a blueprint, you will need to wait a couple of minutes while your engineers study it before you can use it on any future levels. Beach chairs help draw in tourists, but do not provide any profit. Alternatively, shops provide you with profit as well as help with increasing the number of tourists. In Vacation Mogul you can only construct buildings on open spaces that have no trees located on them. Experience points can be used to speed up the learning process of a purchased blueprint. Selling existing buildings can earn extra cash quickly for levels that require a high amount of profit. Properties can be purchased from other owners. Some will already be upgraded while others will just be a basic foundation. Always upgrade shops and accommodation buildings (like bungalows, motels and hotels) for the highest daily profit earnings. You can identify the level a building has by the number of stars that are displayed. To access later levels in the game, you will need to repeat any of the earlier levels where a silver or gold trophy was not earned. Note: Any played level can be repeated. 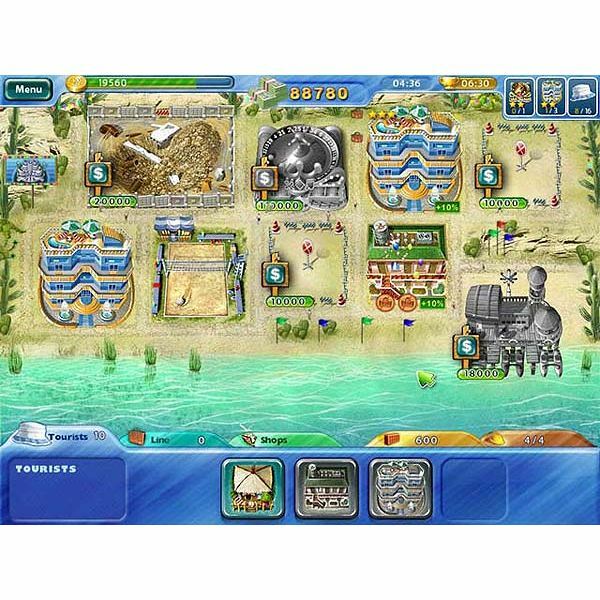 *Screenshot images for the Vacation Mogul game article were created by Sheila Robinson.